While looking for something at a local pet store to comfort my three rat girls after the death of a cage mate, I took a chance on the Super Pet Couch Pouch. 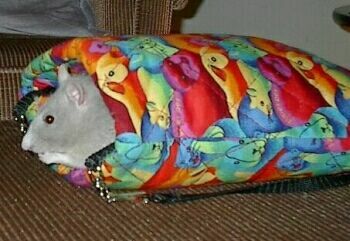 This colorful critter carrier is quilted for extra-snuggleability and includes a shoulder strap to carry your rat safely around the house with you. I find this especially nice, since one of my girls has a balance problem from an ear infection as a young ratlet-- she can't easily ride on my shoulder. My shyest girl will even climb into the pouch for an extended visit. The strap can be removed, allowing the couch pouch to be attached to the side of a cage if desired. While I wish the strap were a little wider when all my girls are riding in it at once, I haven't heard any complaints from them! The picture included here has all three of my adult girls crammed in it like a clown car, but it could hold an adult male rat as easily, as it seems to fit about 2 pounds worth of rat. For a price tag of about $10-13, it is a great addition to rat playtime. Note: As with all cloth toys of this nature, it is important to remove this from your rats' play area when if it gets chewed up so they don't get themselves stuck.